The Tapestry of Love is I believe the fourth novel by Rosy Thornton. Set in the idyllic French Countryside, Catherine is trying to start a new life now that her children have grown and she is divorced. Her plans are to start a business as a seamstress but didn’t realise how difficult the French bureaucracy can be. Poor weather, reserved locals and then there is Patrick Castagnol. Who is he? With her sister Bryony coming to stay will things change for the better? Can she fall in love with this new dream of a fresh start and the people around her? 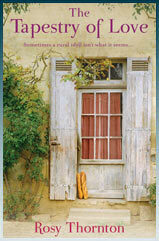 Rosy has written a really beautiful gentle story where you really feel that you are in this remote part of France. She describes the house, people and surroundings with such eloquence that makes them come to life. Chapter by chapter you learn a little bit more about each character and what makes them who they are. Whilst there is romance in this novel it is more old-fashioned love rather than steam up your glasses type writing. This is not what I would class as Chick Lit. Thoughtfully written with unexpected elements of humour but also deep sorrow and emotion. A lovely read. Thank you Rosy for introducing me to this novel. You can read more about Rosy Thornton via her website http://rosythornton.com/ or purchase this via amazon http://tiny.cc/se2x8 as an ebook or paperback. Thanks for reading my book, Lou – and for your lovely, generous comments. Anything to do with France gets my attention. Top that up with a recommendation from you, Lou, and it becomes a “must read”. Lovely review for a lovely book! Looks like yet another one to add to my pile, Lou. Sounds right up my street. And I love the cover.